This shrine dates from late in the 1st Century, making it one of the oldest shrines in France. According to tradition, some of the first Christians in the area discovered the statue residing on the branch of an oak tree. They happily took it, and placed it on a nearby wall near a fountain and went to summon the neighbors to show them what they had found. On returning, they found that the statue was not where they had left it. Since this was an isolated spot, they wondered who might have taken it. Later, the statue was found once again where they had first seen it, sitting on the branch of the oak tree. Since Our Lady did not seem to want to be moved, the first chapel was, accordingly, built around the tree, with the branches with the statue being on the upper floor. A parish church, later built next door, shows late 12th century architecture, but the shrine was already very old at this time. 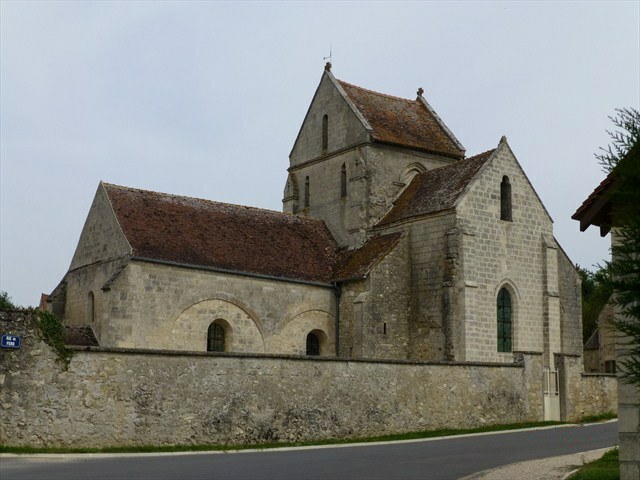 The church and the priory of Nanteuil belonged to the Abbey from the first years of the twelfth century. Construction took place, attributed to Philippe-Auguste, who wanted to show his gratitude to the Blessed Virgin for a double benefit: the first was for when his prayer had been answered and his thirsting army had been drenched by rain to quench that thirst; the second was for their victory over the king of England and their taking of Montrichard. In fact, the second column that supports the arch on the right side is the face of the monarch, along with the faces of other leaders of his army. The devotion of Kings and Lords for the Virgin of Nanteuil was shared by the people, and from everywhere they came on pilgrimage, especially the Monday of Pentecost, which gave birth to a famous fair which was established before the fourteenth century and continues to this day. The religious upheavals of the 16th Century left Our Lady of Nanteuil undisturbed, but before the French Revolution, a change came over the statue. The smiling face became sad, and many pilgrims testified to seeing tears on the cheeks. The Revolution indeed brought sorrow to the shrine. One of the pilgrims threw a rope around the neck of the statue and pulled it to the ground, breaking all but the head. A woman who carelessly tossed the head aside and looked for better loot was punished by almost instant death. Another woman took up the mutilated head and hid it until the destruction was over and a new body could be made to go with it. One of the many miracles recorded of Our Lady of Nanteuil is the cure of a little boy who was completely crippled. His mother carried him on her back for three pilgrimages, and the third time to the shrine of Our Lady of Nanteuil, he returned home entirely cured. The shrine was especially famous for the cures of sick children, and was a favorite of King Louis XI. This shrine had a privileged altar that was highly indulgenced. It was a favorite of the Venerable Olier, and of that saintly vagabond, Benedict Joseph Labre.